Jacques Cousteau developed, with Émile Gagnan, the first aqualung in 1943. For the next 50 years, he explored the world's oceans. he found there. Being an environmentalist, Cousteau strove to persuade people to take care of the Earth, especially the oceans. Cousteau's interest with the sea began when he was a child. Although he suffered from poor health, he became an avid swimmer. Throughout his youth, he explored the bottoms of pools and lakes and practiced holding his breath underwater. Breathing underwater would become a challenge for Cousteau to solve later in life. Cousteau graduated from high school in 1929, and in 1930 he joined the French Navy. After completing his mandatory world tour with the navy, Cousteau decided he wanted to become a naval aviator and began training for it. Unfortunately, he was involved in a serious car accident that ended his hopes of becoming a flier. The accident did not end his naval career, however; he went to sea instead. Cousteau enjoyed exploring the sea and wanted to examine what was below its surface. Remembering lessons learned in his youth about breathing underwater, he knew he had to develop a breathing apparatus if he was to stay underwater for longer periods of time. Since the sixteenth century, inventors had been trying to meet the challenge of breathing underwater for long periods of time. Various apparatuses were invented for meeting this challenge. One such apparatus was a head-piece attached to a long breathing tube, but the tube was awkward to wear because it did not allow divers to dive very deep, and it was heavy. Another apparatus was a tank of oxygen not unlike today's aqualung . The early oxygen tank could not compress and regulate air the way it was needed for deep-sea diving. The air pressure in a diver's lungs has to be the same as the water pressure acting upon the diver's body. Dr. Christian Lambertsen designed an apparatus for the United States military in 1939 that he called the "Self-Contained Underwater Oxygen Breathing Apparatus." The military called it "SCUBA." However, scuba gear proved useful only for shallow dives. Cousteau wanted the freedom to explore the ocean at great depths but knew the available equipment would not allow him to make such dives, because he had experimented with these traditional breathing apparatuses. He joined French engineer Émile Gagnan in designing a breathing apparatus that would appropriately regulate air pressure at varying water depths. In 1943, after several experiments, Cousteau and Gagnan finally invented the demand regulator, solving the problem of equalizing air pressure in the lungs with the water pressure acting upon the diver's body. They attached the regulator to three cylinders of air. The complete set of equipment was called the "aqualung" and would enable divers to dive deeper for longer periods of time. Through this accomplishment, Cousteau and Gagnan had modernized scuba diving. Cousteau could now explore the depths of the ocean more freely. Eventually he would record and film what he saw below the ocean's surface and share his findings with both the scientific community and the general public. While Cousteau worked on the aqualung, he continued performing his naval duties. France was involved in World War II (1939–1945) against Nazi Germany during this time. Cousteau aided France's war efforts through his resistance work. The French resistance would secretly battle the Nazis by conducting spy missions, sabotage, and by aiding people who fled persecution. One of Cousteau's resistance roles included spying on Italian naval forces. 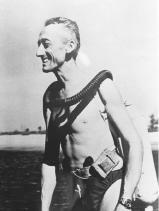 After the Allied victory in World War II, Cousteau once again concentrated on exploring the depths of the ocean. In 1950, with the financial help of a friend, Cousteau bought a minesweeper called Calypso and converted it into a research vessel. Calypso transported Cousteau, his wife Simone, and a research crew around the world to such places as Easter Island, Mexico, California, and the Antarctic Circle. In the early 1960s, Cousteau experimented with underwater living by developing the Conshelf living stations in which divers, on three separate occasions, stayed for periods of one week to nearly a month. The divers tested living conditions and conducted ocean experiments. Through these experiments, Cousteau gave the world a better understanding of the ocean. Jacques Cousteau made films of ocean life and sunken ships that were havens for fish and plant life. The 1955 film, The Silent World, and the 1964 film, World without Sun, are two of his most famous movies. The Silent World won an Oscar and the Cannes International Film Festival's prestigious Palme d'Or award. Cousteau also wrote many books including The Silent World (1953), World without Sun (1965), and The Whale (1972). Educating the world about ocean life was Cousteau's focus. This focus was apparent on the television series that ran from 1968 to 1975, The Undersea World of Jacques Cousteau. Cousteau studied sharks, squid, dolphins, penguins, and many other sea creatures and invited the viewing audience to learn with him. In his later years, Cousteau continued to learn about the sea and share his knowledge with the world. He started the Cousteau Society and became an active environmentalist. Jacques Cousteau died in June 1997 at the age of 87. SEE ALSO Careers in Oceanography ; Earle, Sylvia ; Submarines and Submersibles . Munson, Richard. Cousteau: The Captain and His World. New York: William Morrow and Company, Inc., 1989. Reef, Catherine. Jacques Cousteau: Champion of the Sea. Frederick, MD: Twenty-First Century Books, 1992. Bellis, Mary. "Inventors of Scuba Diving Equipment." About, Inc. <http://www.inventors.about.com/library/inventors/blscuba.htm> . "Cousteau People: Jacques-Yves Cousteau, Founder." About TCS. The Cousteau Society. <http://www.cousteausociety.org/tcs_people.html> .